My brother once told me that he had read somewhere that our brains have the habit of specifying the general in our memories. Often, when we remember something from our childhood that "happened all the time" or that we did "all the time," a deeper look will reveal that it actually only happened once. My memory of pie dough cookies is the perfect example of this phenomenon. For years I had this memory of us kids making pie dough cookies from leftover scraps whenever our mother made pie. We would cut out different shapes, sprinkle them with sugar and cinnamon, and have a nice little treat to tide us over until we could cut into the actual pie. On one of my recent holiday visits home, my sister-in-law was making pecan tassies (basically a miniature pecan pie), and she had leftover pie dough, so we made pie dough cookies with them. I started to tell my story of how we always made pie dough cookies when we were kids, but something made me stop and go over my memories of how many times we actually did that. And I came up with: once. I have one memory of making pie dough cookies in my mother's kitchen with my older sisters. We didn't do it all the time at all. Which, when I think about it, makes more sense, because my mother did not make all that many pies. I was reminded of this peculiarity this weekend when I made strawberry rhubarb empanadas (yes, more on those later). After I had rolled out the dough and cut as many circles as I could (and as many as I could stand to fill, fold and crimp), I still had the last bits of dough from around the circles. 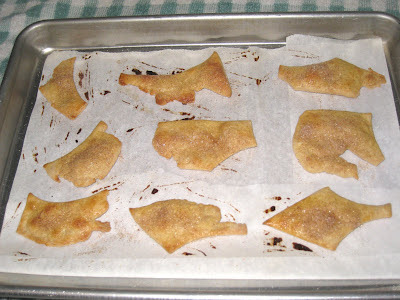 So I cut them into "interesting" shapes, put them on a parchment-lined baking sheet, brushed them with the egg wash I used for the empanadas, and sprinkled them with cinnamon and sugar. When my oven reached 350 deg. F. on its way to the 400 deg. 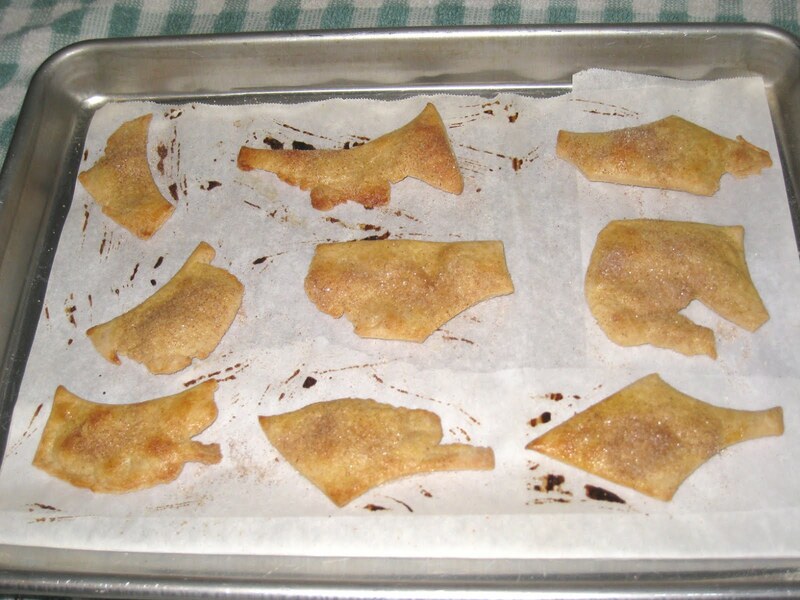 F. I wanted for the empanadas, I put the pie dough pieces in the oven and let them bake for 15 to 20 minutes, until they were golden. I had an ulterior motive for doing this. I was experimenting with the dough, using half all-purpose and half white whole wheat flour, so I was a little apprehensive whether or not it would work, and this was the perfect way for me to test it. The result was quite satisfactory. The dough was a little more sturdy than regular pie crust, which makes it the perfect dough to hold up to empanadas and other hand-held pies. I was especially gratified to discover that it was still flaky, if not quite as tender and flaky as an all-purpose crust would be. For regular pies I will probably continue to use all-purpose flour, but for empanadas and cobblers this (slightly) healthier version will work beautifully. Recalls: "Boxed Pasta Mix Products"